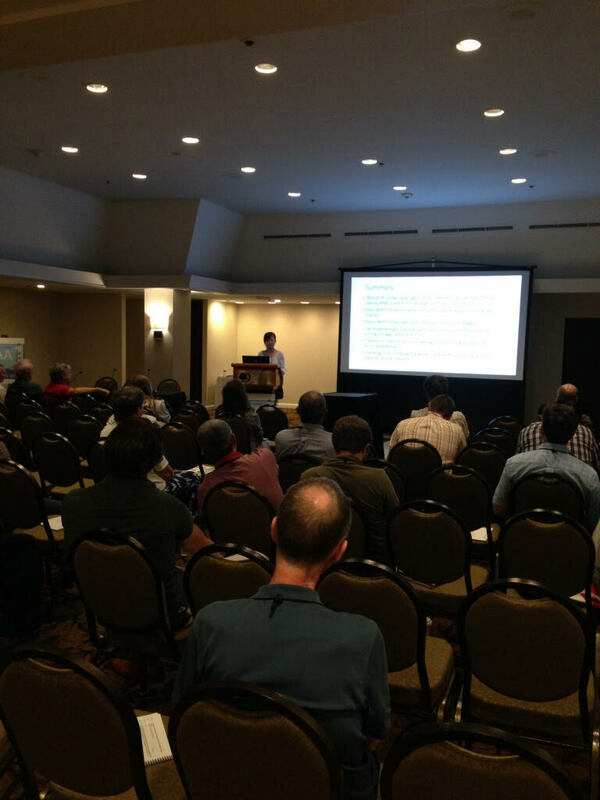 Dr. Yi Wang made a presentation with the title of A National Effort to Identify Fry Processing Clones with Low Acrylamide-forming Potential at the 2015 Potato Association of America Annual Meeting (Portland, ME). 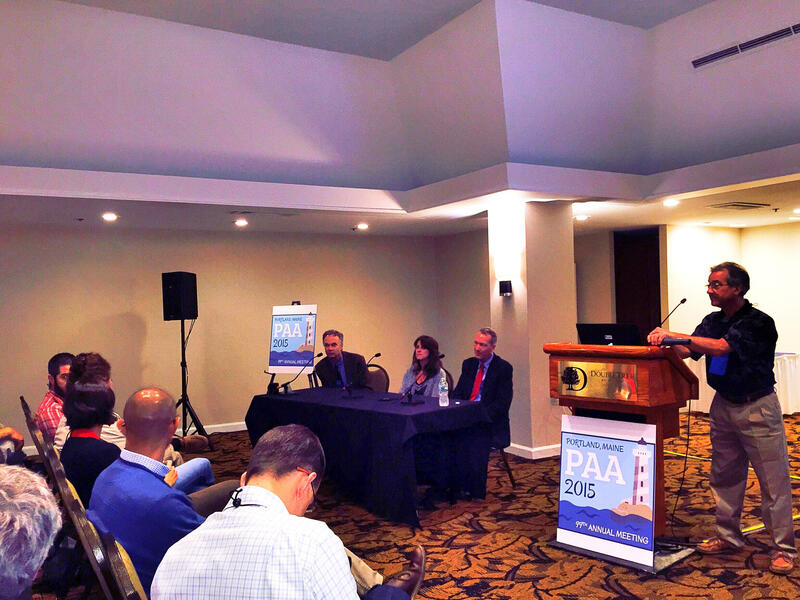 A symposium named Mitigation of Acrylamide: a Multidisciplinary Approach to an Industry Problem was held at the 2015 PAA annual meeting. Dr. Carl Rosen from U of Minnesota (left), Dr. Susie Thompson from North Dakota State U (middle), and Dr. Paul Bethke from U of Wisconsin-Madison were discussing with the audience about using agronomic, breeding approaches to reduce acrylamide level in potatoes made for French Fries. 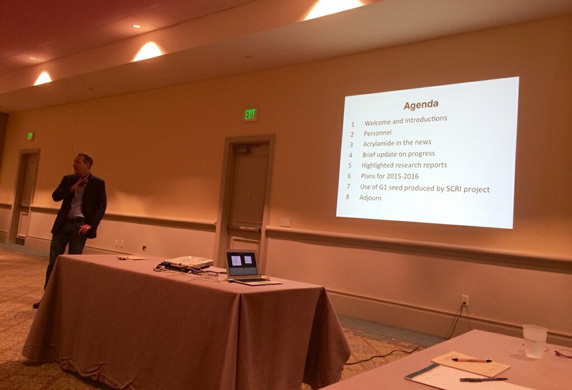 Dr. Paul Bethke hosted a 2-hr presentation to the SCRI-Acrylamide project advisory committee at the 2015 Potato Expo held at Orlando, FL. The presentation was about update on the ongoing activities of the project and the upcoming research plan in the 2015 growing season. Results about the 2014 NFPT, 2014 SCRI agronomic trials, 2014 seed production of four elite clones (Dakota Russet, A02507-2LB, AF4296-3, AC96052-1RU) were presented and discussed during the meeting. 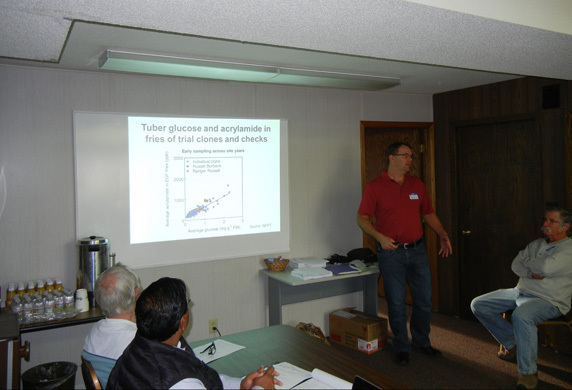 In addition, guest speakers Dr. Wallace Huffman from Iowa State University and Dr. David Douches from Michigan State University gave a 15-min talk (each) about their ongoing research on acrylamide in potato products. 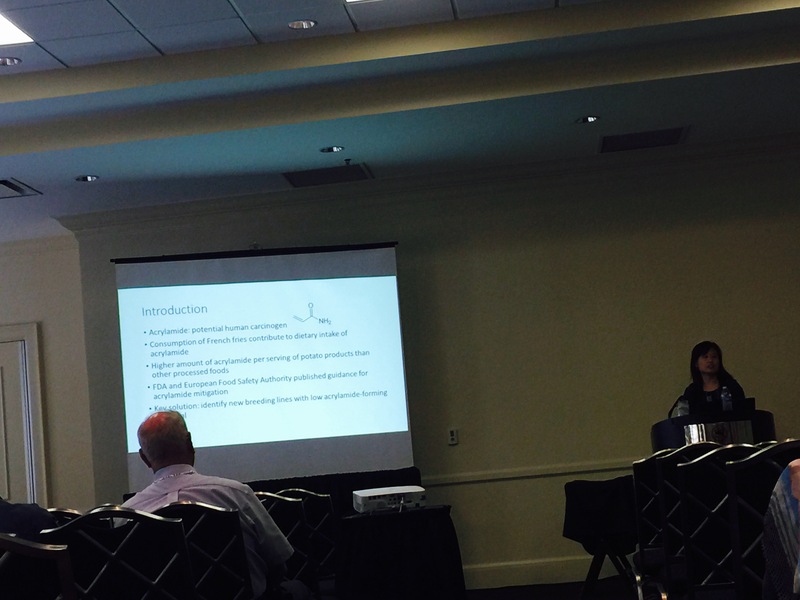 Dr. Yi Wang made a 15-minutes presentation at the 2014 ASA-CSSA-SSSA International Annual Meeting held at Long Beach, CA (November 3rd to 6th, 2014). The title of her presentation is collaboration between universities and industry to solve the potato acrylamide problem. About 40 people representing the industry and university researchers attended the talk. 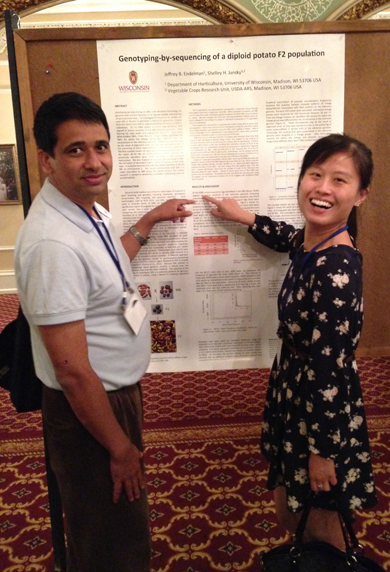 Dr. Yi Wang and Dr. Rosyara (Postdoc fellow with Dr. Jeffrey Endelman) at the PAA meeting (July 28th to 31st, Spokane, WA). Both looked very excited to see peers in the potato research community. They were currently working on the SCRI-Acrylamide grant. 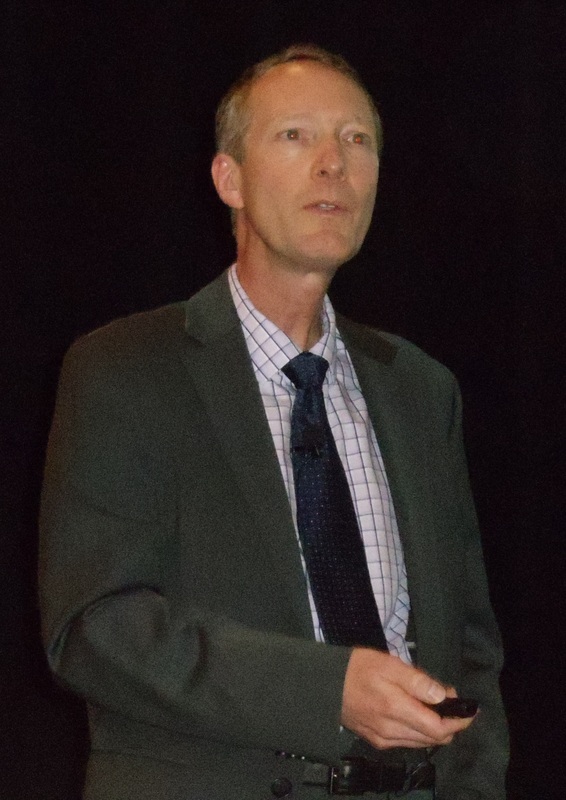 At the meeting (June 25-27, Sun Valley, ID), Bethke talked about the ongoing research and outreach activities within the SCRI-Acrylamide grant. The audience included a diverse group of people mostly from the potato industry. He had a question of ‘what is next?’ from the audience after his talk, and the answers were that 1) to connect more with the industry to deliver the research findings to the growers and potato processing industry; 2) to investigate approaches on both agronomic and molecular biology levels that aim at reducing acrylamide in the end products; 3) to select new elite potato breeding lines consistently showing low acrylamide forming potential when grown across different environments. 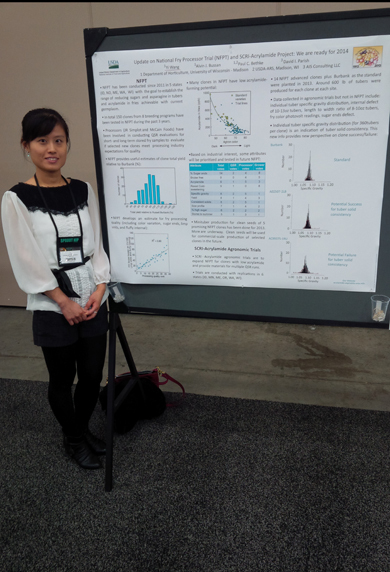 Dr. Yi Wang, UW-Madison Research Associate and Outreach Extension Specialist with SCRI-Acrylamide, presented a poster about NFPT/SCRI-Acrylamide project during the poster session, held by Potato Association of America, at the 2014 Potato Expo, San Antonio, TX. 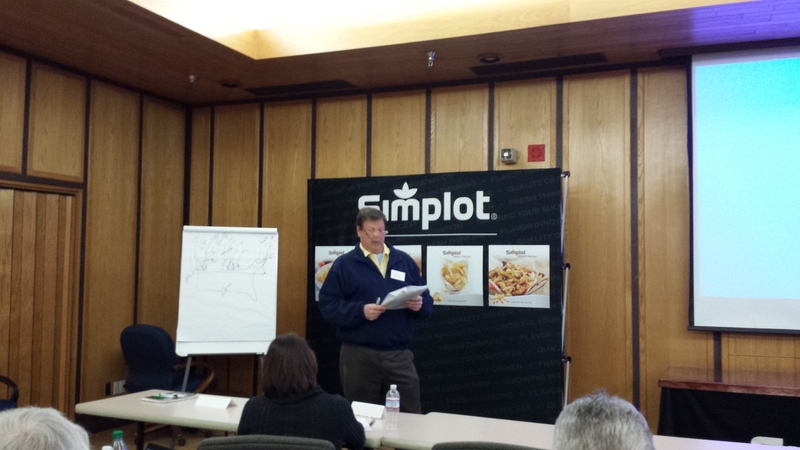 Jim Fuller, agronomist from McCain Foods, USA, was presenting the QSR results of 2013 NFPT. David Parish, USPB/AIS Consulting, was giving an update on NFPT budget in 2014-2016. Dr. A.J. 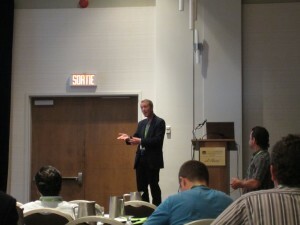 Bussan gave a talk about ongoing research and activities of NFPT/SCRI-acrylamide at the EGF meeting. 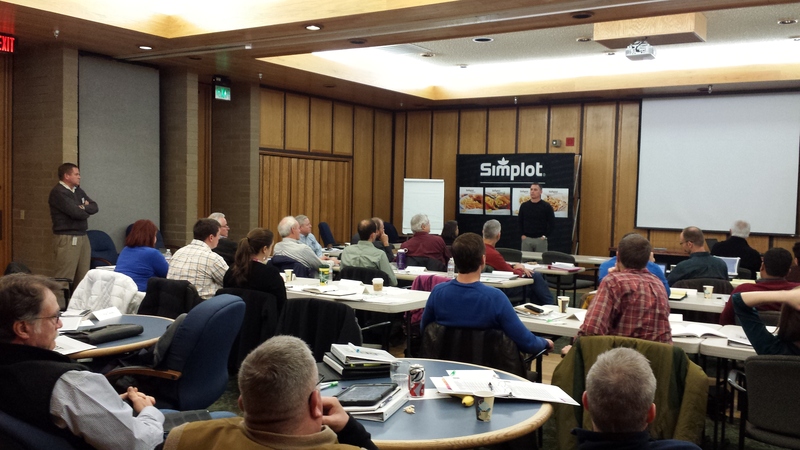 Many representatives from the processing industry (McCain Foods, Simplot, ConAgra) as well as from the potato grower associations (WPVGA, Idaho Potato Commission) were in the audience. Rich Novy, a plant geneticist in Aberdeen, Idaho, who works for the USDA-ARS, and other researchers are developing potatoes with lower levels of glucose, a reducing sugar, and an amino acid called asparagine. Combined, they form acrylamide when heated at high temperatures. read here. 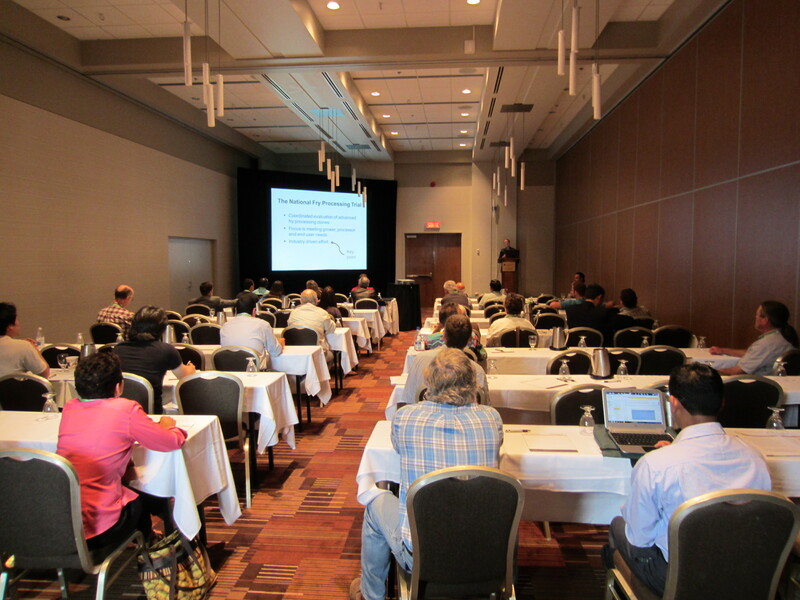 acrylamide-forming potential” in the 2013 Potato Association of America Meeting that is held in Quebec City, Canada on July 28th to August 1st. Dr. A.J. Bussan, Dr. Paul Bethke, and Dr. Yi Wang gave a group presentation on NFPT/NCPT updates in the 2013 National Potato Council Summer Meeting that was held in Walla Walla, WA on June 26th to 28th.